Notes And Updates: The battery powered fans are no longer sold by RV Parts Plus. 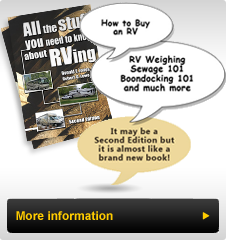 Check with your local RV Dealer for a battery or solar powered fan. All RV refrigerator brands have been the subject of numerous recalls. Go to the maker's website, click on the recall link and determine if your refrigerator is affected by the recall. If it is, it is recommended that you turn it of, make an appointment to have the recall work (which involves installing a module that measures the boiler temperature and shuts the fridge down should the temperature exceed the safe maximum level). There is a distinct fire hazard that can have life threatening consequences if the recall is not completed. While attending a Bounders of America (BOA) Spring 2001 Rally in Urbanna, Virginia, I attended a presentation by a representative of the Dometic Corporation, supplier to Fleetwood for the vast majority of the refrigerators in our Bounders. I have referred to frequent service tips and hints in the past (see Tech Tips #7,8,12) and I will refrain from repeating them here. However a few items came to my attention that I thought should be recorded for reference. The first was that newer Bounders refrigerators now come with a three year Dometic warranty. The catch is that you must take the coach back to a Dometic servicing dealer at least annually to validate the warranty for the next year. If you do not then the warranty is voided. The cost for the inspection is the responsibility of the owner and it would take about an hour to complete. Questions were asked about what would happen if you have not followed this regime up to this point. The answer was that Dometic admits that they have not advertised this requirement outside of the owner's manual (who reads the owners manual?) and unless they believe that a defect was not due to the owner's actions they would probably cover the repair. However the period of grace is rapidly running out and you had better have the unit inspected ASAP or you run the risk of not having a warranty repair made if a problem arises. Effectively the industry is moving to a series of back-to-back one-year warranties, which are cumulated, into a two three or four year warranty. The caveat is that there is greater responsibility on the coach owner to routinely return to an authorized dealer to check and service the appliance. The onus of proof of compliance is on the owner. A word to the wise: Have your refrigerator (and other appliances) inspected by an authorized dealer or run the risk of not having warranty coverage on them. One of the most frequently asked questions heard at these seminars is: How cold should my fridge get? The answer is it depends --- on the ambient temperature, but generally the fridge will operate at 38-42 degrees Fahrenheit (4-6 degrees Celsius). This represents a 40-degree drop from typical ambient temperature, with the temperature control set at 3. A refrigerator in an older coach will lose its efficiency as it ages and it may not be able to maintain this temperature without adjusting to 4 or 5. The freezer section is designed to be 30 degrees (15 degrees Celsius) less than the fridge temperature. How can I increase efficiency? First, install a battery operated cooling fan inside the fridge that increases air circulation inside. Place it in the back and blow down or in the front and blow upwards, to assist in the airflow. Secondly, install a cooling assist fan at the bottom of the cooling tower on the outside within the access panel area. This fan will force air up through the cooling unit and assist the unit in dissipating the heat extracted from within the fridge. These can be either solar powered or 12V DC units. On most side-by-side Dometic fridges and some two-door units, you can also move the thermistor (a white unit with two fine wires going to it) that is attached to the fins in the back of the inside of the fridge. With the fridge set at 3 and normal operating temperatures of 70-75 degrees outside, measure the inside temperature using a fridge thermometer. If the fridge is too warm move the thermistor upwards on the fin (Up is Colder like "Up North"). This will calibrate the temperature and maintain the proper temperature on 3. Hopefully these items make it easier for you to live with you Dometic refrigerator.